The Navigation Pane is a new feature in Access 2007 that has existing Access users grumbling about many losses of functionality compared to the previous database container. However, it comes with a powerful new feature, the Search Bar, which lets you find your objects in a whole new way. Once you're comfortable with it, you'll find it difficult to go back. 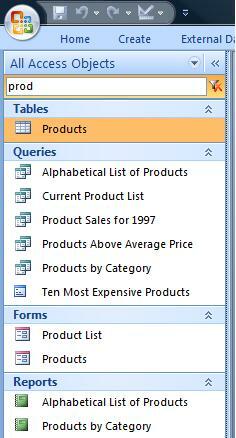 The Microsoft Access 2007 Search Bar makes it much easier to locate similarly named objects across your database. Quickly see the list of similarly spelled objects such as tables, queries, forms, reports, macros and modules. All you need to enter is a few letters of the objects you're interested in, and the list of objects is filtered to just the matching names. The letters don't have to be at the beginning of the object name, any consecutive letters work. Because the navigation pane can show objects across multiple types, you can see similarly named tables, queries, forms, etc. In the example on the right, notice how the search on "prod" lists all the Product related objects. This is a feature that the Access 2003 and earlier database container could never offer, and lets you find objects by name rather than visually in the container. It requires a mindset shift, but once you're comfortable with it, you'll wonder how you worked without it. For some unknown reason, when you create a new database or open an Access database from an earlier version, the Search Bar is not visible. To remedy this, right click on the Navigation Pane and select Search Bar. The Search Bar can also be set programmatically with the SetOption command in VBA. By setting this property to TRUE, it displays the Search Bar in the Navigation Pane. You remove it by setting this to FALSE.